Porto situated in the North of Portugal and is the second largest city of Lisbon. Porto is one of the oldest cities in Europe and is recognized by UNESCO in 1996. Porto is known for its famous wine Port and its mild climate. To see this amazing city we recommend you to rent a cheap car. Rentalcargroup.com offers cheap rental cars from Porto Airport. Porto is famous for its fantastic churches and its Parisian style plazas. The rich port wine of Porto is also very popular around the world and many people come just to see where it is made. Most of the area in and around Porto is historical and there are a lot of vineyards and beautiful scenery. See it all easily with the help of car rental services. The city’s main tourist information centre is located in the Rua Clube dos Fenianos, where a lot of shops can be found as well. The tourism centre is opposite to the Camara Municipal, where city guides are available in English. The area of Avenida dos Aliados is also famous for its shops. Close to Avenida dos Aliados is the famous Torre dos Clérigos, which is famous for its breathtaking views of the city. Ribeira, which is a river front area, is a good place to start a holiday. Here, people can travel in the traditional boats, which were once used to ferry port wine from vineyards. These river cruises run every hour and during the busy days the cruise departs every 45 minutes. 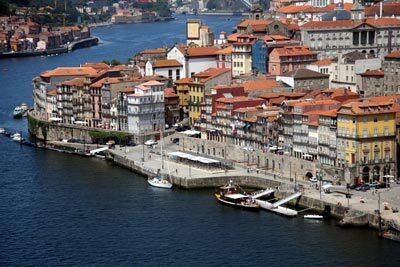 Ribeira attracts the most crowds in Porto; however, it is not overly crowded all the time. The Caso de Infate is a famous attraction in the area. The Gothic church of Igreja de Sao Francisco and the magnificent Palácio da Bolsa are famous tourist locations and reaching them is easy with Porto car hire services. Porto Cathedral, which was built in the 12th century, is also close by. This cathedral is located on a hilltop and it resembles a fortress. There are not many museums in the city but the few museums that are in the city are interesting. The most famous museums of Porto are Museu Nacional Soares dos Reis and the Museu de Arte Contemporânea. Most of the tourist attractions in Porto are really seasonal, for example, the beaches around Matosinhos. There are plenty of beaches are around Praia da Barra and Costa Nova. The beaches around Costa Nova are more famous as surfing spots and they are very crowded during the summer months. Aveiro, a nearby town, is regarded by most as the Portuguese version of Venice because it has a lot of canal and bridges. Cordoaria is another worth visiting area in Porto. There are a lot of landmarks here and those who visit Avenia dos Aliados also visit Cordoaria because it is close by. The popular attractions of this place are the Igreja do Carmo church on the Praça Gomes Teixeira and the palatial Hospital Geral de Santo António. Make the most of every minute in the city and opt for car rental for travelling in style and comfort. As not all car rental companies are open 24 hours at Porto Airport, you will still be able to collect your car before or after opening hours. Click on the car rental company logo for the opening hours and check the detailed rental terms for the extra fee. Some car rental companies have an office or desk in the arrival terminal of Porto which is indicated as On Airport. If the car rental company does not have an office or desk at the arrival terminal it is Off Airport, which means that most of the time the car rental supplier provides a free shuttle bus from the airport to the car rental desk. When traveling we advise to carry some Porto to avoid any unwanted surprises. At many Porto Airport there are Money Exchange offices in order to change your local currency. The local time code for Porto is WEST. When traveling to Porto make sure to check the local weather conditions in order to avoid any unpleasant surprises. Porto has approximately 237,591 inhabitants. Porto is a popular rent a car destination, there are many car rental companies in Porto with a wide range of different car categories. Many of our clients have rented a car in Porto and had good experiences. Do not wait with booking your car for Porto before you know prices will go up and the availability will get low. Rentalcargroup.com is one of the largest independent car rental online brokers; we compare prices for car rentals from more than 35,000 locations. Porto There are many car rental agents offering different categories of cars from Compact or Economy to SUV's; we can offer you a wide range of rental cars. So leave us looking for you and just select the car that suits you the most. It is very simple. Most major car rental agents in Porto offer one way rentals. One-way rental is when you collect the car in one place and return the car in another location. In most cases the car rental agent will charge an extra fee if you wish to return the vehicle at a different location. In the terms and conditions will state if the one-way fee is included in the rental price. If the one-way charge is not included in the rental price, the one way charge needs to be paid on arrival directly to the car rental agent. Last month, the average car rental length in Porto was 3 days. The average rental car length in Porto is 6 days. The most booked rental car type currently in Porto is STANDARD cars. Last year, the most booked rental car type in Porto were MINI cars. How much does it cost to rent a car in Porto? Last month, the average car rental price was 172 USD. Last year, how much did it cost to rent a car in Porto? Last year, the average car rental price was 217 USD. What is the current average daily price to rent a in Porto? Last month, the average rental price was 57 USD per day. How much did it cost to rent a car in Porto over the past 12 months? Last Year, the average rental price was 39 USD per day. The car rental companies available in Porto are: . See below last 5 customer reviews. Our customers rated Porto Car Rental with an average of 10.00 based on 1 ratings. Easyto book. easy to pickup. easy to return.car had no problems.